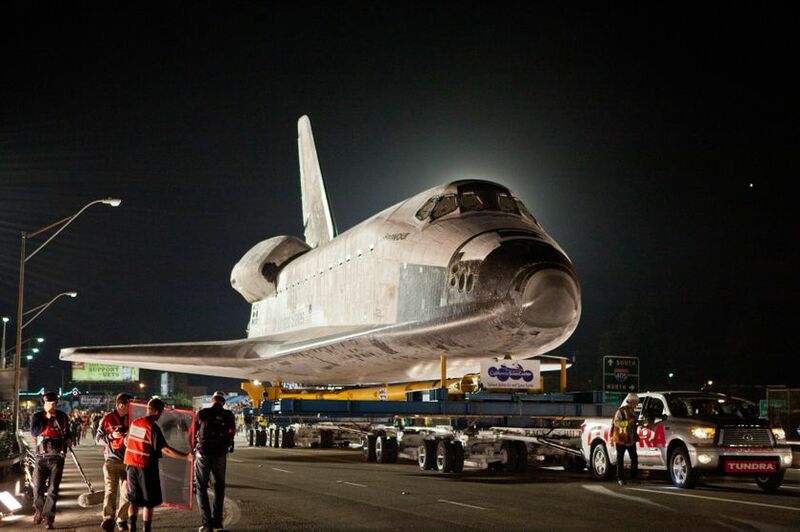 TORONTO (Oct. 15, 2012) – A Toyota Tundra half-ton pickup truck without any special modifications successfully towed the 150,000 pound space shuttle Endeavour across a bridge spanning the America’s busiest freeway on Friday night, Oct. 12. The tow was a result of a 20-year partnership between Toyota and the California Science Center to raise awareness of the space program and continue public education through exhibits and events. The shuttle’s 19 kilometer route over city streets to its new home at the California Science Center includes one passage over the 405 Freeway. 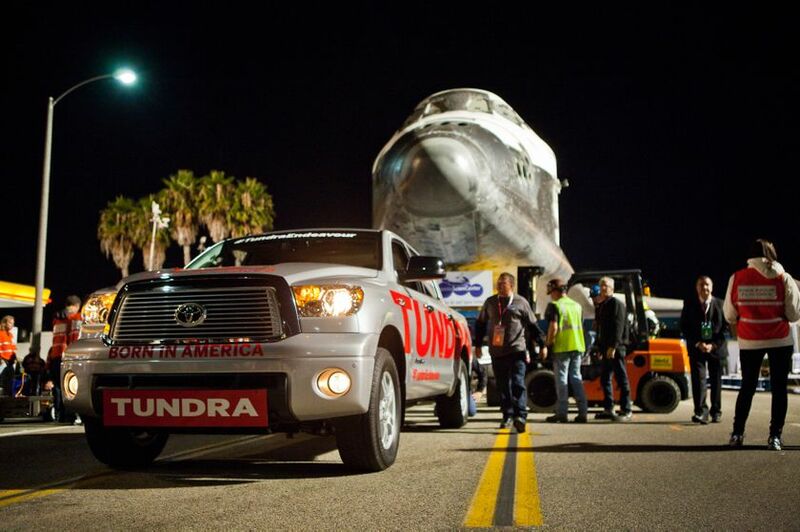 The Tundra assisted in the transport of the Endeavour as it journeyed over the Manchester Boulevard Bridge—an area that required a lighter tow mechanism than other portions of the route for weight distribution purposes. Toyota did extensive testing and worked with the Sarens Group, a heavy lifting and engineering transport company, to develop a dolly to move the Endeavour over the bridge. The model selected was a stock 2012 Tundra CrewMax 4x4 with Toyota’s 5.7-liter iForce V8, producing 381 horsepower. All Tundra trucks are produced exclusively at Toyota Motor Manufacturing, Texas in San Antonio. The truck used to tow the Endeavour was purchased from a Southern California Toyota dealer, with no modifications or special equipment added for the tow. The Tundra was piloted by longtime Toyota professional driver Matt McBride. Riding along was Garrett Reisman, one of the astronauts aboard the orbiter when it traveled to the International Space Station in 2008. From start to finish, it took 5 minutes to cross the bridge. The Science Center has a popular working exhibit utilizing a Tundra that demonstrates the physics of leverage. The Tundra used to tow the shuttle will replace the existing truck when the Endeavour exhibit opens on Oct. 30, 2012. 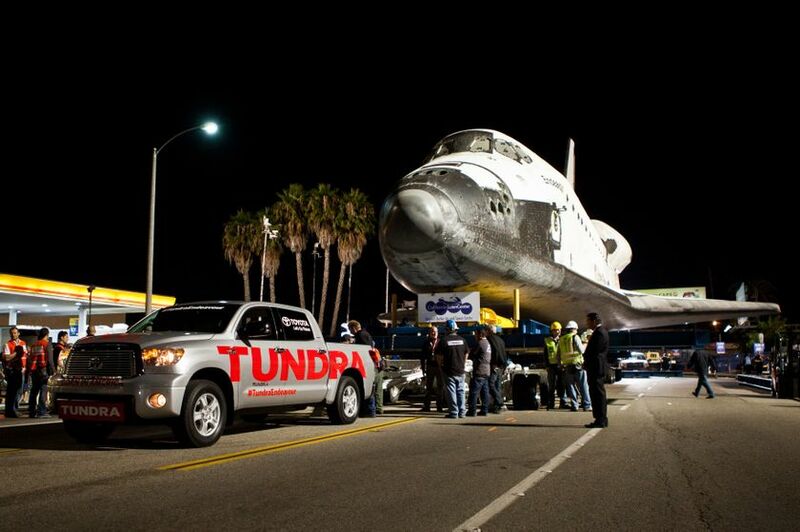 For more information on the Tundra Endeavour, please visitwww.toyota.com/tundraendeavour.